Founded in the late 1800’s and now home to a population of nearly 7,000, Nappanee, IN, rests on a heritage of hard work and a desire to consistently change and evolve with the times. With a unique blend of the past and the future, the city is home to many attractions, festivals, and historic features and buildings. Nappanee.org provides information on nearly every aspect of the city to allow site visitors to embrace and discover Nappanee. The main page of the site showcases the many events and sights of Nappanee. 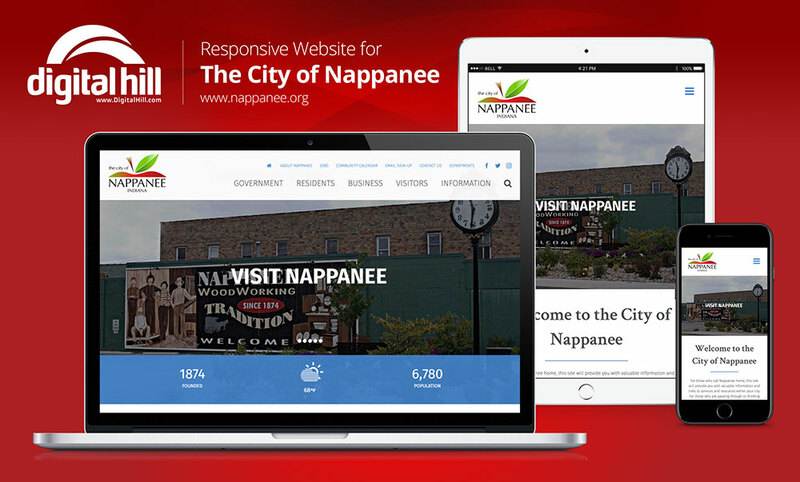 With simple navigation, clean layout, mobile responsiveness and natural flow, Nappanee.org allows the city to step into the future. The website reflects the city’s present and future and allows people to connect and engage with the city. Relevant information about the city is presented right in the header and footer of the site. What do you want or need to know about Nappanee? The site design makes it easy to find. Just take a quick glance at the city and click! Although Nappanee is a small town, it’s buzzing with activity! The interactive community calendar provides a directory of the many community events, theater, plays, games, outings, and festivals that happen in the city. As a result, if an event needs to be promoted, it can be added to the calendar with a form. Nappanee welcomes visitors from all over. To help introduce them to the city, the site features a section just for visitors who want to visit or move to the vibrant city. There are button links to the Nappanee official social pages at the top of the page and an Instagram feed of key hashtags right on the home page of the website. With so much going on in the city, an email newsletter delivers local news right to the inboxes of subscribers. Therefore helping the city stay in touch with people. Made possible by Digital Hill, the WordPress website Nappanee.org provides a glimpse into what the city is all about. In addition to powerful management tools, the site is easy to update and keep current with the latest from multiple city offices and community events. Serving Northern Indiana and businesses around the nation for years, Digital Hill provides web solutions that can help take a business to the next level. Interested in talking about your new website? Call us at 888-537-0703.